Far from tackling the terrible social problems that lie at the heart of the Kahui twins’ death, these “solutions” will simply create the conditions for more such tragedies. They will serve to further brutalise the most oppressed sections of society and to create even more intolerable pressures on their daily lives. At the same time, they will be used to drastically reduce government expenditure on social programs—a key demand of New Zealand big business. Now I am really pissed at Bob Geldof who says it is no defence that New Zealand's non-government aid to the Third World is high. Much of global poverty was government business. Only governments could deal with the structures of extreme poverty. Private aid dealt with the symptoms. Below is one of the kids we've sponsored and a typical piece from the regular progress reports we receive. 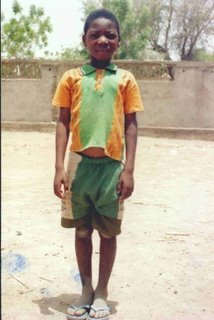 He lives in Mali, one of the poorest countries in the world with 65 percent of its land desert or semi-desert. 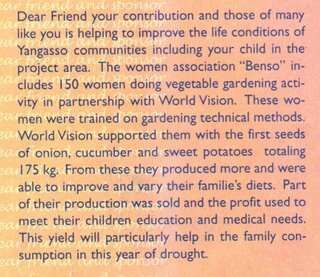 World Vision builds schools, irrigation systems, they train people in income generating activities and they educate about loan management, primary health and nutrition. That doesn't sound like dealing with the symptoms to me. If government taxes more to increase their international aid contribution, taxpayers are likely to donate less to those private charities which are so effective. The first part is exactly what Geldof is pushing for and the second part is what obviously doesn't matter to him because he believes private charity only deals with the symptoms. 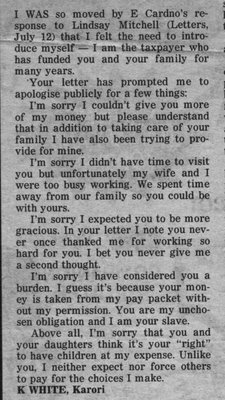 ...bugger off Bob. Heard him on radio lambasting New Zealand for our governments "pathetic" contributions to international aid. Good. Governments give away taxpayer's money willy-nilly. Has he looked at New Zealander's support for private agencies like World Vision and CCF? We put our money where we know agencies are getting results because they account to us. Govt to govt aid is probably the most likely to be subject to corruption. Geldof is well-intended I know, and likeable to boot but....talk about a statist. A married couple rushed to the hospital because the woman was in labour. The doctor told them, "There's a new machine you might want to try; it transfers some of the labour pains from the mother to the father." The couple agreed to try it, so the doctor hooked the machine up and set it to transfer 10 percent of the pain from the mother to the father. The husband said, "I feel okay, so turn it up more." The doctor turned it up to 50 percent, and the husband said "Why not put it all on me because I'm not feeling a thing." The doctor warned them "This much could kill you if you're not prepared," and only when the husband confirmed he was ready, turned the machine up to 100 percent. Still the husband didn't feel a thing, and both went home happy it had been a pain-free labour. When they got home they found the gardener dead on the front lawn. Unfortunately I won't be near the computer at that time. Shiny houses are out as far as the Twizel Community Board is concerned. Board chairman Bruce White said at a recent community board meeting they had received complaints about the use of unpainted corrugated iron cladding on new houses. He said people were complaining because of the reflection from the tin. "People are getting headaches when they drive past." The community board were not opposed to the use of corrugated iron but it needed to be painted he said. Mackenzie District Council senior planner Hayley Shearer said there was a recommended colour palette in place for Twizel since 1994 but it was not a requirement. In the interests of balance and objectivity I am bound to report that New Plymouth prison has apparently found the key to keeping prisons drug-free. Closer work with police, greater use of drug dogs but most particularly the confiscation of mobile phones. Good work. Crime costs New Zealand $9.1 billion a year, and Government efforts to fight it are not working, says a hard-hitting Treasury report. But according to Annette King, on becoming Minister of Police, “In the past six years, we have added more than 1400 police staff, the crime rate has reduced 13.8 percent, and crime resolution rates are increasingly steadily. Recorded crime is down to levels last seen over 20 years ago and our resolution rates equate exceedingly well with other police agencies world-wide." Back to the Herald, It singles out the rising number of people in prison and the cost of keeping them there, as an example, and makes several suggestions aimed at reducing both. They include reviewing the policy of longer sentences and re-introducing suspended sentences. But Labour has claimed repeatedly that crime is down due, in part, to the success of the Sentencing and Parole Reform Act. Personally I don't mind if we spend 7 percent of gdp on crime but let's get the balance right. The figures should look more like $7b on fighting and preventing crime and $2b on picking up the costs of any failure. Not the other way around. Oh, and the first thing we should be doing is discouraging the births of more budding criminals right now. That place is in the news again. "Fathers out of the picture"
The Times says, "Fathers out of the picture." As if that's a new development. Many fathers have been either willingly or unwillingly out of the picture for a long time. But this headline pertains to reform of an act governing requirements for IVF. Single mothers and lesbians will no longer be discriminated against. Clinics won't have to consider a father as necessary to a child's welfare. Indulging some sentimentality for a moment - I don't like to think what my life would have been like without my dear Dad. But I've been lucky. A few kids are better off not knowing their Dads or even their Mums. Children born through IVF treatment are sure to be wanted and cherished. But, just as an after-thought, I wonder if the applicant for treatment has to prove financial capability for raising the child? 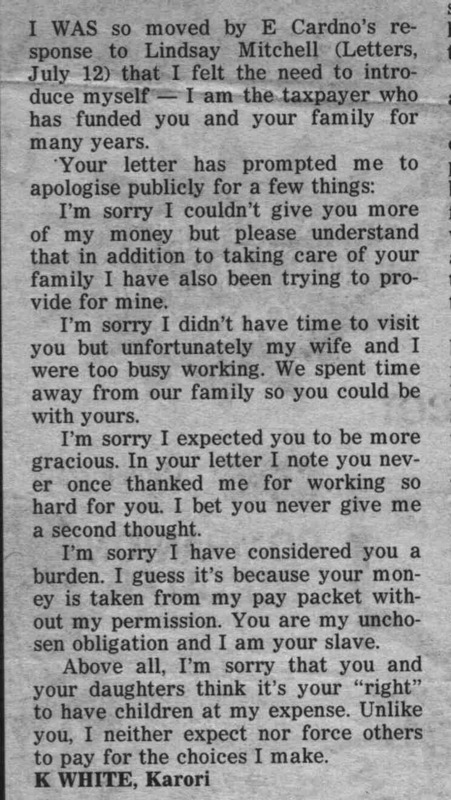 Harder for a would-be single mother. I guess if the clinic can't discriminate against a lesbian or single mother they can't discriminate against a would-be beneficiary. The fact that Mr Chauvel is practising homosexual man is hugely significant to the Labour Party. Practising? Have you ever heard any other MP described as a practising heterosexual?? And if he wasn't "practising" would he be less significant to the Labour Party? Some interesting statistics from the US, relevant here as many 'western' countries are following the same trends. Longer life expectancy, delayed marriage and childbearing, and increased childlessness add up to a longer life without kids, says Barbara Dafoe Whitehead in a new report released by the nonpartisan National Marriage Project at Rutgers University. * In 1970, 73.6 percent of women ages 25-29 had at least 1 minor child at home; 30 years later, only 48.7 percent did. * In 1990, the most common household type was married couples with children. Now, single-parent, childless households are the most prevalent. * Today, more women in their 40s are childless, the report says. Only 1 in 10 were childless in 1976; while in 2004, it was about 1 in 5. It's ironic that welfare states in developed countries have actually reduced the number of children produced yet the life-blood of welfare states is an adequate supply of budding taxpayers. There is no way that current demographic trends will allow our welfare state to continue as we know it. Because the NZ Living Standards 2004 report showed more beneficiaries were experiencing hardship many groups are once again calling for higher payments. Benson-Pope says that changes after 2004 have already done that. 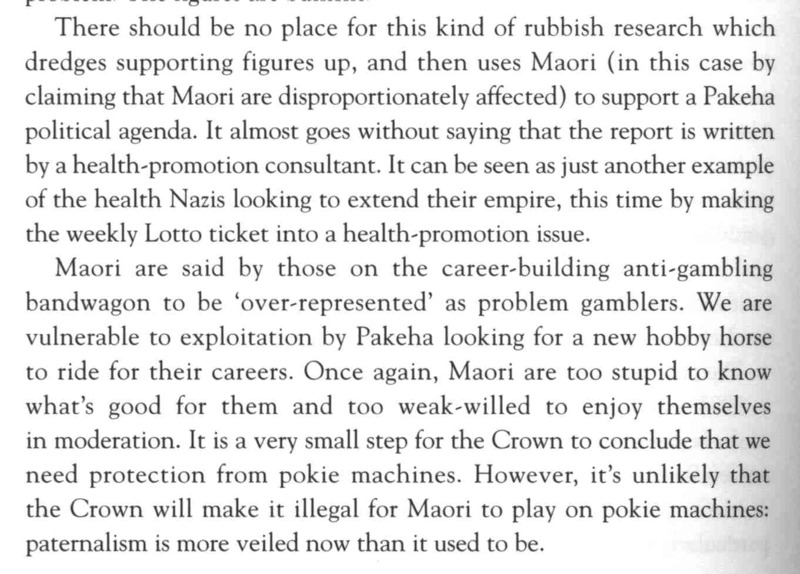 What caught my eye was Pita Sharple's comment which illustrates the 'rock and a hard place' the Maori Party have got themselves into with their 'welfare policy'. Maori Party co-leader Pita Sharples said while he did not like benefits because they entrenched dependency, people receiving them needed to be paid a realistic income. He called on central and local government agencies and large companies to address the real problem, which he said was despondent communities with no jobs caught in a cycle of hopelessness. BUT increasing benefit rates entrenches dependency. There has to be a significant advantage in working or some people simply will not. And the second part of his comment is not much use either. We had the 'jobs jolt' policy which was supposed to stop people moving to these 'despondent communities with no jobs'. The major failure of that policy was it didn't include people on the DPB. If a parent can get a benefit then someone else can tag along. 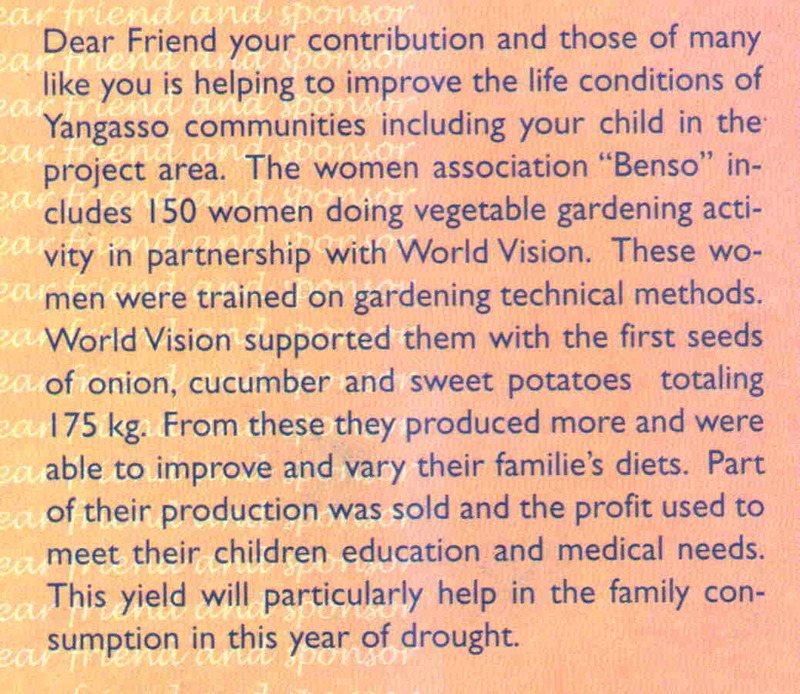 And we still have the populations of these communities being artificially sustained by procreation on a benefit. How low does unemployment have to go before we admit that it is no longer responsible for the cycle of hopelessness? There are plenty of employers crying out for workers but welfare has made, and continues to make potentially productive people unreliable and unemployable. Update; Just watched Tariana on Breakfast TV. She said the Maori Party doesn't like the welfare system but there will always be people on benefits so we need to look after them properly (read pay them more). It's a bit like Sue Kedgely saying the Greens don't like soft drinks but we should make the cans bigger so people don't go thirsty. For perspective there are around 7,000 inmates at any given time. What stands out is the huge increase, forty five percent, between 2003 and 2005. Inside and out, drugs are becoming more pervasive. I believe they are also one reason for more beneficiaries experiencing severe hardship. Only my opinion though, I hasten to add. Oswald has reminded me about my DPB campaign and I took a moment to reflect on its beginnings. Back in 2001 a local newspaper ran a story about my petition which kicked off a storm of letter-writing that ran about 50/50 for/against. Eventually the editor had to close the debate. I know Britain is full of incompetent water board officials and stabbed Glaswegians but even so I fell on my knees this morning and kissed the ground, because I’ve just spent three weeks trying to work in America. It’s known as the land of the free and I’m sure it is if you get up in the morning, go to work in a petrol station, eat nothing but double-egg burgers — with cheese — and take your children to little league. But if you step outside the loop, if you try to do something a bit zany, you will find that you’re in a police state. - Don't take out APs on Clothes Trucks. This is an insidious practice by companies who visit low income people with their trucks (which sell more than just clothes). They appeal to people's instant gratification impulse. The purchaser authorises an automatic payment so they can purchase but when the item is paid off the AP continues. If the customer attempts to get the money back in cash they are told no, you can only use your credit on the truck. At which point the company may throw in a sweetener of a bit of extra credit. But the goods are well over-priced. The APs tend to just turn over. - Resist offers to up your bankcard credit limit. - Don't think having WINZ pay you a small weekly amount for a cellphone is better than having a landline. You can be contacted but will quickly use up your outgoing allowance. Looking for jobs is virtually impossible if you can't make outgoing phonecalls. In fact, your everyday life is extremely restricted. Better to pay your phonebill in the first place. - Don't hoard advertising throw-aways "just in case you miss a bargain". If you haven't thought about it first you don't need it. - for females, use contraceptive injections which stop you menstruating. Saves you know where. - for males, use condoms. They are much cheaper than child support payments, even at the beneficiary level of about $12 a week. Over the life of a child you will spend $11,232. What's a packet of condoms worth? According to the latest Ministry of Social Development New Zealand Living Standards 2004 report the majority of sole-parent families are reliant on benefits. Welfare commentator, Lindsay Mitchell, calculates that between 64 and 69 percent of sole-parent families currently rely on benefits. In 2004 the MSD put the figure at 62 percent. The report says sole-parent families are three times more likely to be experiencing 'severe hardship' than two-parent families. "But it is interesting to note what constraints are reported by parents categorised as suffering 'severe hardship', " said Mitchell. "Thirty seven percent of children didn't have or participate in play station or x-box. One assumes then that 63 percent did have access to or own these electronic devices. Yet in the same 'severe hardship' category parents reported not buying books, being unable to afford school outings or postponing children's doctors and dentist visits." While 32 percent of sole-parent beneficiaries are in the 'severe hardship' category 29 percent reported 'fairly comfortable, comfortable or good'living standards. The wide variation amongst living standards cannot be explained by variation of income given these families would have similar entitlements. The problems associated with being in 'severe hardship' would appear to have more to do with how money is spent than the level of income received. The implications of this have once again been ignored by the Child Poverty Action Group, Green Party and Maori Party who continue to call for increased benefit payments into these homes. That is not the answer. Only 6 percent of sole-parent families with market income were experiencing 'severe hardship' while 54 percent had 'fairly comfortable' or better living standards. The improvement of living standards for sole-parents lies with paid work and better priorities. "This is such a useful piece of paper we should cut it into strips and put it in the gents". So said Tim Dower, NewstalkZB host. "How much did this 'research' cost me?" “The report shows that a number of key factors contribute to living standards,” Deputy Chief Executive of Social Development Policy and Knowledge, Marcel Lauzière, said. “While income can certainly help improve our living standards, this research demonstrates the importance of sustained employment, higher levels of education, home ownership and other assets". “People tend to have lower living standards if they have experienced events such as multiple marriage break-ups, financial or employment shocks, or serious health issues." “These factors seem to have a cumulative effect. People with up to seven life shocks have a similar average living standard to those with no life shocks. Eight seems to be the turning point, leading to substantially lower average living standards and a high likelihood of hardship,” Marcel Lauzière, said. From Karl du Fresne's DomPost column today, "Ninety and still a nanny." "Still, Labour has one huge advantage over National; We have a vague idea of what it stands for even if we may not like it." This is from Scotland where Labour has mooted a plan to prevent drug addicts from having children. The proposals, drawn up by Labour MSP Duncan McNeil, would require addicts to sign a "social contract", under which they would only get benefits and methadone if they agreed not to have children while addicted to drugs. While not as extreme as Mr McNeil's last proposal - that contraceptives should be added to methadone - these latest plans do represent an extension of the state's influence into personal liberty. A spokeswoman for the Scottish Drugs Forum, which brings together a range of different bodies working with drugs policy and information, said the plans were "dehumanising". She said it was wrong for the state to tell anyone not to have children and worse to single out drug users for attack. Before you react remember these people are living off their fellow citizens, many of whom would never consent to supporting their actions. What about their liberty and choices? The state can't tell people not to have children. I agree. But it can say that it will not pay them to. It amazes me that Mr McNeil's plan would be seen as radical. Good god. It is far more extreme to be handing methadone over to women on a daily basis while encouraging them to have more children with extra benefits. And yes. We do it here too. Stuff has a story about the growing number of students who are physically assaulting other pupils and school teachers - 7,200 in 2005 up from 6,500 the previous year. New Zealand Primary Principals' Federation Pat Newman said schools were concerned that children were showing severe behaviour problems at younger ages. "What alarms us most is the small percentage of young children who are showing extreme levels of violence rather than low-level abuse such as hitting or throwing," he said. "We know what is needed. It is not rocket science. It's just there are more dysfunctional children in society not being cared for by their own families," he said. The breakdown between assaults on other pupils and assaults on staff shows overwhelmingly it is other pupils bearing the brunt. In 2003 only 7 percent of the assaults were on staff. 18 percent of the total cases were at Primary. A conversation with somebody who works in a nearby decile 2 community revealed that many kids are now stood down and simply stay home, despite a legal requirement to be attending school. The police know they are about and try to keep an eye on them. According to Pat Newman the answer is, "If we are to help these violent children while keeping others safe, we need to have the money to employ people to look after them while they get help." Advertising infant formula is banned under the Code on Marketing of Breast Milk Substitutes, but companies are expected to be self-regulating. However Nutricia has breached that and even stated a baby can be fed formula from birth - for some there is no alternative - and that a baby can be breastfed and bottlefed simultaneously. Wow. Outlandish. So now the Women's Health Action group want requirements of the Code made compulsory. We are all idiots are we not, unable to make up our own minds about the needs of our children. I promised to blog some comparative statistics regarding child abuse and neglect between now and thirty years ago. The closest data I have to hand is from 1971. In that year 17,744 cases concerning the welfare of children were handled by social workers. The NZ Yearbook says, "Cases may be referred by neighbours, police, teachers, employers, doctors, solicitors, etc., or by parents themselves who are seeking advice and guidance." The population aged 14 or under was 857,000. Cases represented 2 percent of the relevant population. In 2005 there were 53,097 notifications to CYF. The 14 and under population was 877,000. Cases represented 6 percent of that number. In 2006/07 notifications are predicted to reach 8 percent. Obviously many qualifications could be made to this data. For instance not all referrals go to CYF. They may be made to other social service agencies. Today, people may be more forthcoming about their suspicions. Then again there may be more distrust of government agencies than thirty-odd years ago. Cases may represent more than one child or the same child within the one year period. These calculations are only for comparative purposes. Never a huge Beatles fan, I still find Penny Lane one of their most evocative songs. Now a cloud is descending over the street after which this very famous song was named. According to the DomPost Penny Lane faces being wiped from the map because of associations with the slave trade. "Councillors in Liverpool are considering plans to rename all streets named after people linked to slavery...Penny Lane is thought to be named after 18th century slave ship owner James Penny." A UK correspondent to NewstalkZB added that councillors are considering renaming it after a young black teenager who was killed in a race incident in Liverpool. His name was Anthony Walker. I don't really get it. Expunge one reminder of an unpleasant aspect of local history to replace it with another. Back to this most extraordinary little book, Maori Health. 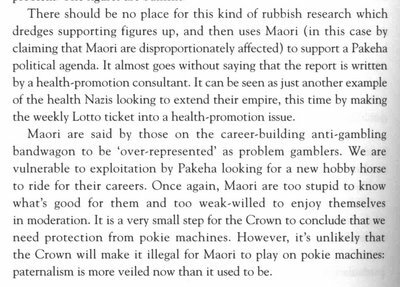 You may recall I blogged some of the pages about Maori and smoking which afforded a completely different viewpoint from these two authors, Peter Caccioppoli, Ngati Kahungunu, chairman of Kotahitanga Community Trust and GP and medical researcher, Rhys Cullen. As before, if you are interested I will scan some more. 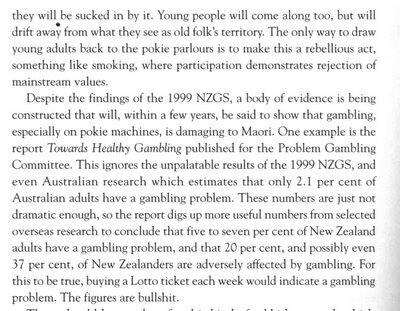 They go on to suggest a better way to identify any gambling health problems and deal with them. A newcomer to this blog has described me as "cynical and obsessive" but nevertheless thinks I am "genuine". I am all of these. Maybe I should apologise for having gotten into something of a funk over the past two weeks. When children are murdered I feel responsible. This is the task I set myself five years ago, when Lillybing died. I would attack this practice of allowing people to use children as meal tickets and then giving not a damn for their wellbeing. When an extreme case like the Kahuis hits the headlines I feel like I am failing. I have been accused of grandstanding. Believe me, I'd rather go away and paint or play piano or read all of the books I've bought or borrowed from the library. It's not ME I want any spotlight to go on. 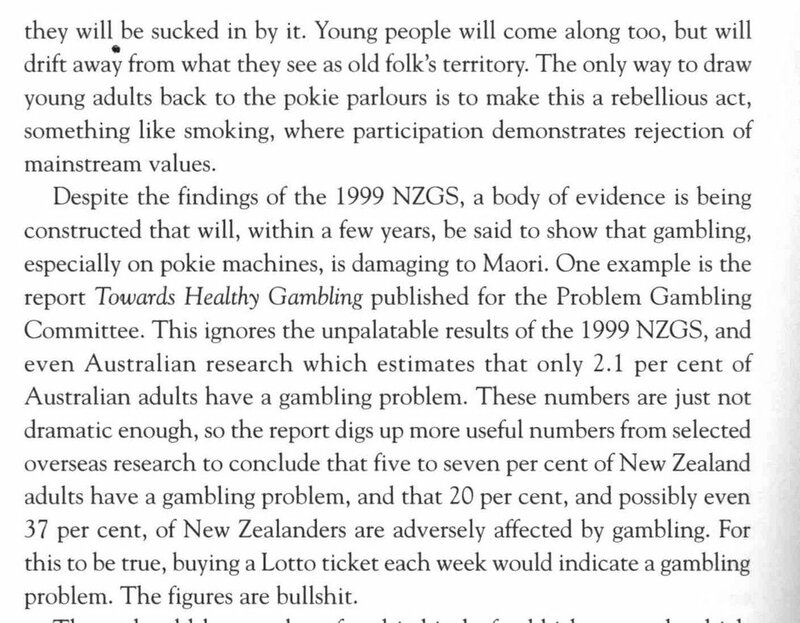 Its the utterly crass, destructive, insane laws that ensure things are going to get worse for some NZ kids. The Spanish Society of General Medicine is now calling for extra resources to deal with rising costs. Regional health authorities complain that providing drugs, health and social care for more than a million ageing Brits - and to a lesser extent, German and Dutch - is crippling, prompting the Spanish Health Minister, Elena Salgado, to demand an annual £40m from the UK government. She says expats abuse the system by using health facilities without registering as residents. 'Many are relocating to Spain and receiving medical treatment for serious conditions more quickly and of a high standard unavailable to them on their own NHS but, as many of these are 'invisible' residents and have no appropriate medical cover, Spain is recouping only a fraction of the costs of treating them,' she told fellow ministers. The UK transfers a monthly sum of €175 to Spain for every UK pensioner legally resident but three quarters of Brits, according to research by Spain's Health Ministry, have not applied for a residence card - out of ignorance, fear of taxation or a reluctance to sever ties with Britain. Two thoughts; One, this problem is a further weakness of public healthcare provision and entitlement and two, does our government have this sort of arrangement with Australia and is it being abused? Anybody know? "All we wanted was to bring her home, just give her a chance of a new start. She's not a bad girl," Mr Harawira told Hawke's Bay Today outside the courtroom. Fair enough. But this is the man who has sacked Maori women for smoking. They weren't being shown any leniency. 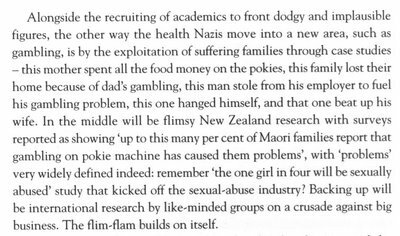 United Future say link between welfare and child abuse is a "nonsense"
“Trying to link the receipt of benefits, directly with the tragedy of child abuse and the Kahui twins, as some sort of ‘cause and effect’ is a nonsense. Direct 'cause and effect'? Maybe not. But link - definitely. Earlier in the week I wrote this piece. Treating child abuse as inclusive of neglect of social and health needs, this is an attempt to put some scale on the problem and its link with welfare receipt. New Zealanders are anxious. How big is the problem of child maltreatment and neglect? How common is the environment the Kahui twins were taken home to? What role have benefits played in this and other tragedies? While the Prime Minister has called for an investigation into beneficiary "clusters" much is already known about those welfare-dependent families that harbour at-risk babies. Looking for clusters is diversionary. Notifications to CYF for child abuse and neglect are predicted to exceed 70,000 next year with 73 percent requiring further action. Of around 550,000 New Zealand families with dependent children, one in five relies on welfare. Children from welfare homes are four times more likely to come to the attention of CYF. So how many children from welfare homes are at risk of abuse, neglect, poor health and/or development problems? Shedding some light on the answer is an evaluation of the Early Start programme for families with young children. It found around 13 percent of Christchurch families were in need of family support services. According to the report, "These referral statistics provide an indicator of the level of need for services within the community..."
The report assesses a trial which took place from 2000-03. 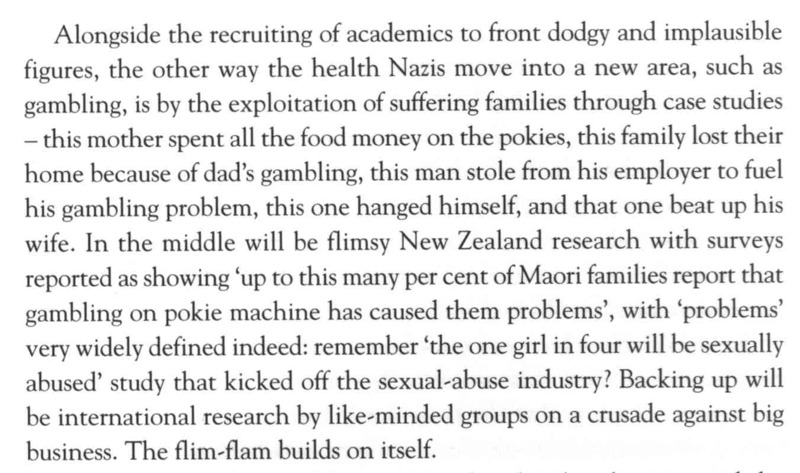 Clients were recruited by Plunket nurses. Of 4,523 families seen over a nineteen month period, 13 percent were deemed needy. Of those, 443 agreed to participate. These clients were then randomly assigned to either the Early Start programme or a control group. The majority, sixty four percent, were single-parent families. Approximately 90 percent of the families were dependent on welfare. On examination of the mother's childhood it was found over half had been raised in a single-parent family; over half had witnessed inter-parental violence and over 40 percent reported being the victim of physical or sexual abuse. The mean age of first ever pregnancy was 19, 80 percent of the pregnancies were unplanned and the majority of the mothers, 63 percent, smoked during the pregnancy. One in six used cannabis. Participants were interviewed at the start and then 12, 24 and 36 month intervals. After one year 21 percent had dropped out of the Early Start programme; after two years 35 and at three years 40 percent. There were no particular factors contributing to the losses. When the control group was compared to the group which had received services, the Early Start programme had delivered "small but consistent benefits in a number of areas relating to child health, education, child abuse, parenting and behavioural outcomes". But in the area of "maternal health and well-being; family stability; family violence; family material circumstances and family exposure to stress and crisis .....no differences emerged." The report commented that welfare dependence, single parenthood and limited education, "conspired to create a situation in which such families were subject to a 'poverty trap' where welfare benefits were likely to provide a very similar level of income to that which could be obtained from full-time workforce participation. A clear challenge facing current social policy is to supplement home visitation methods such as Early Start with policies that both reduce welfare dependence and increase the earning capacity of these families." A couple of important points about welfare dependence in New Zealand are confirmed by this report. One, it highlights the significant inter-generational component of welfare dependence and associated factors. Two, if the statistics can be extrapolated and the authors seem happy to suggest so, it appears that as many as forty percent of welfare families are in need of extra intervention. Resources to meet this level of need are simply not available. While the results for children were encouraging, changing the behaviour and circumstances of mothers (and fathers where they were involved) was another matter. This suggests that regular home visitation services can help the children but not their parents. The provision of obligation-free cash to these families acts to exacerbate problems by exempting them from normal work patterns. With no requirement to exercise the self-discipline needed to hold down a job it is also easier to indulge destructive habits and behaviours. While making a difference to just one child is invaluable, particularly if a cycle is broken, without significant policy reform at government level the work of various family support agencies will continue to be thwarted by the provision of conditional, open-ended benefits.